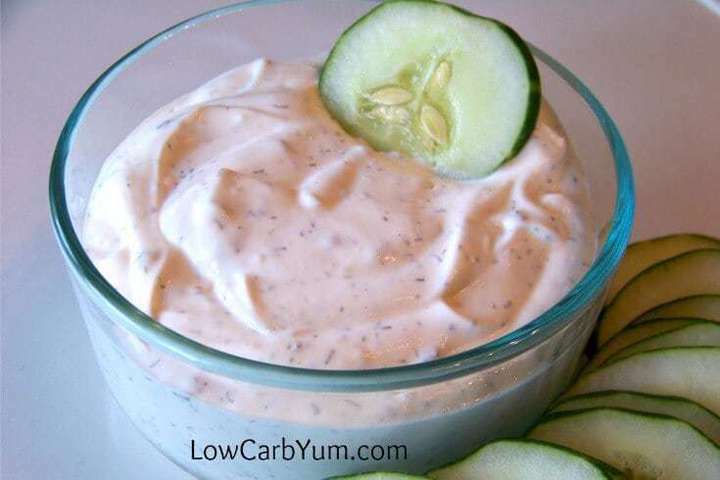 Make this creamy low carb dip or keto ranch dressing with dried spices. 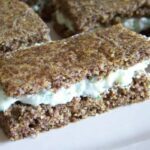 It’s better than pre-made ones and those made from a dry seasoning mix. We have so many cucumbers coming out of the garden. I’ve been cutting them up in slices to snack on. I made a simple homemade dressing to give the slices a little more flavor. 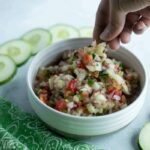 The dressing can also be used as a low carb dip for dunking any of the many low carb vegetables. 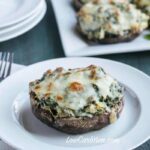 It’s perfect for a veggie tray party appetizer. And, it doesn’t take long to whip up. I used to buy seasoning mixes to make homemade dips. 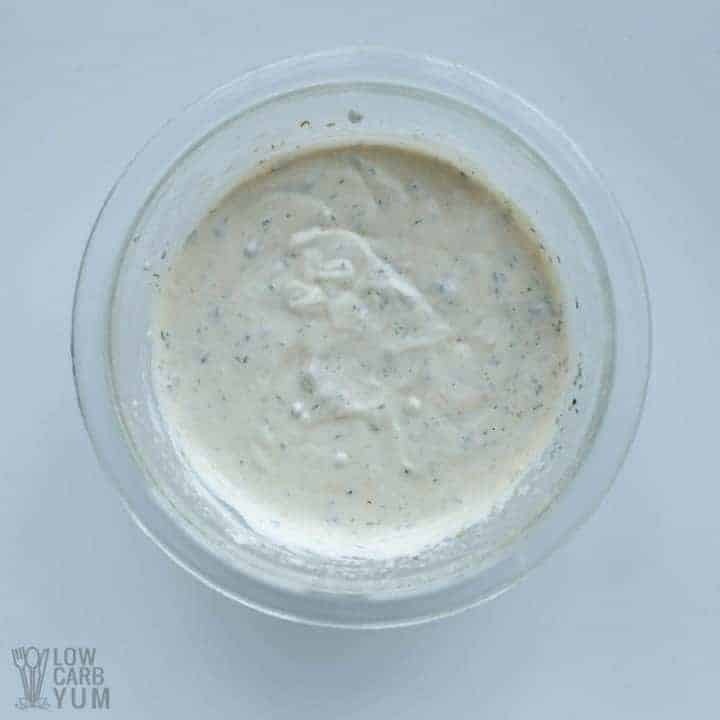 But, it doesn’t take much effort to just use your own spice mix to make a keto ranch dressing. Dill goes great with cucumbers so I added it into the seasoning. 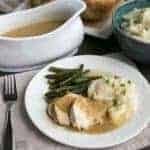 But you can certainly leave it out for a more traditional ranch flavored low carb dressing. 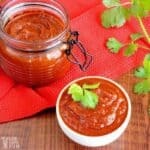 To use this recipe for a salad dressing, you’ll want add in a little low carb milk to thin it out. Buttermilk is also a nice touch if you don’t mind the extra carbs. I’d use either almond or coconut milk that’s sold in a carton. Just a little bit of liquid would be needed to turn this low carb dip into a dressing. 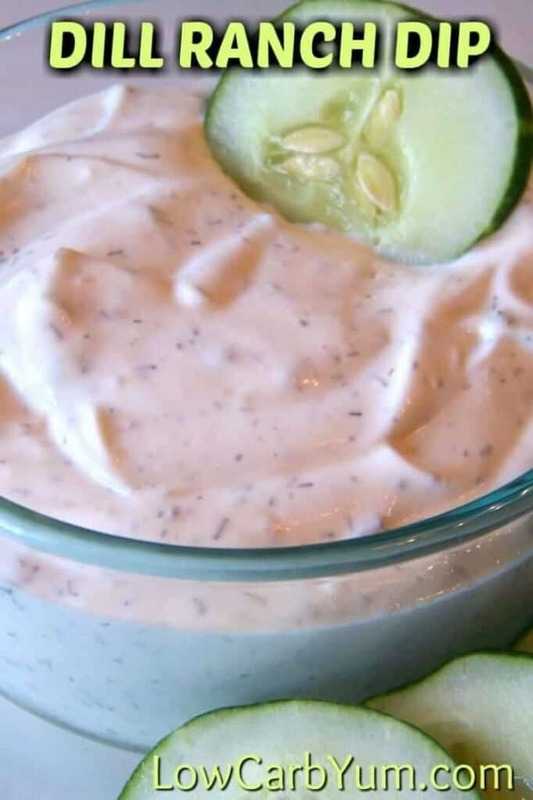 Some may prefer a keto ranch dressing without mayonnaise. Sour cream or yogurt are typical substitutes. But carbs in those ingredients are a bit more than mayo. If you don’t mind the green color, avocado is also an option too. Just mash it up for a fantastic replacement for mayonnaise in this and other recipes. Seed oils go rancid quickly so many people avoid them. I personally stick with products that are made without seed oil. Most commercially prepared mayonnaise is made from seed oil. But you can make your own mayo from avocado oil or buy an avocado mayonnaise. To make your own, simply use a stick blender to combine egg yolks, vinegar, and oil with some spices. 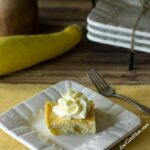 I use the method described in my coconut oil mayonnaise recipe which I sometimes make with all avocado oil. When I don’t have the time to make my own mayo, I like the avocado may made by Primal Kitchen. 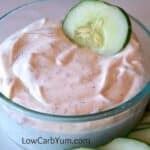 It’s perfect for using in this keto ranch dressing low carb dip! 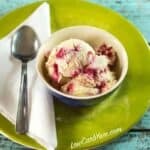 It’s so easy to whip up this low carb dressing. In fact, you may already have all the ingredients on hand. 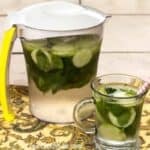 From start to finish, the recipe should take no longer than two minutes. You literally just dump the ingredients into a bowl and whisk them together. Super simple, right? So why bother buying the prepared salad dressing that contains funky ingredients? It’s a cinch to make your own at home. 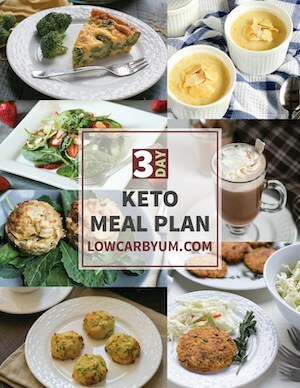 Although it’s a great low carb dip for veggies, I like to use it as a sauce for keto salmon patties too. 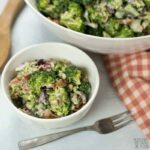 Do you have a favorite way to use this low carb dressing besides on a salad? 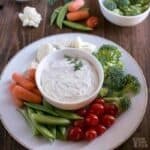 A creamy low carb dill ranch dip for vegetables. 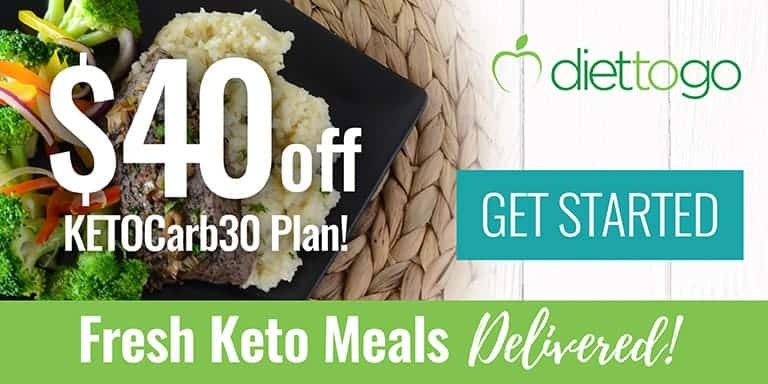 It's better and much lower in carbs than pre-made dips or ones made from a dry seasoning mix. 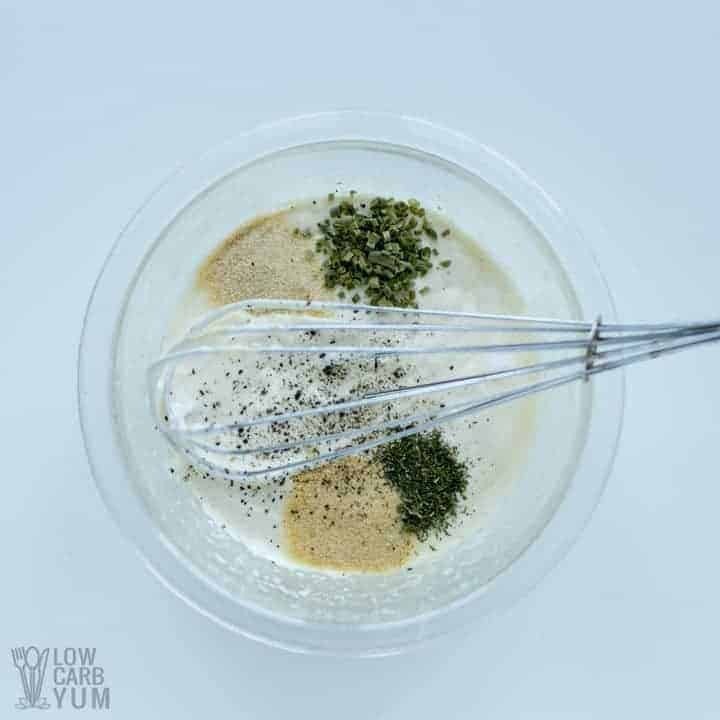 In a large bowl, whisk together the mayonnaise, sour cream, chives, parsley, dill, garlic powder, onion powder, salt and pepper. Thin out with a little bit of low carb almond or coconut milk for a salad dressing.